This one’s another issue that was eating my brain for the past 2 days. Little bit if story first. I have a Windows 10 Pro virtual machine on my MacBook Pro. Things went well until I tried installing SQL Server 2014 Express, which required .Net Framework 3.5. .Net 3.5 is built-in and we need to enable it from “Turn Windows Features On or Off”. 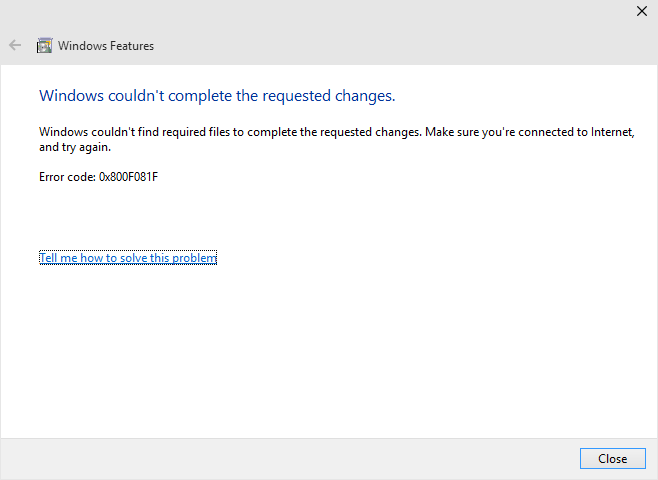 That “Tell me how to solve this problem” takes you to this link: .NET Framework 3.5 installation error: 0x800F0906, 0x800F081F, 0x800F0907. Unfortunately, for me, this post did nothing other than wasting my 10 minutes of time. Surfing about this error further led me to this post: Offline install of .NET Framework 3.5 in Windows 10 using DISM. I could then install/enable .Net 3.5 Framework on my VM and continue with GP installation. This entry was posted in .NET, Operating System, OS, Windows 10. Bookmark the permalink.